Nestled in the heart of Southern Shores, 23 Ocean Blvd. is the perfect spot for your next Outer Banks vacation getaway. Located in the first block of Southern Shores, getting to the house on a busy Saturday is a breeze! Plus you can go straight to the house, as there’s no checking in required with the keyless entry system. Located directly beside a pedestrian crosswalk to the ocean, beach access couldn't be easier at 23 Ocean Blvd. 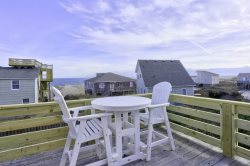 This home is also just a short walk away from great restaurants, shopping and the Kitty Hawk Pier, ensuring that you and your family can experience some of the best local spots with an easy stroll around the neighborhood. You can even park your boat right at the house if you bring it with you! 23 Ocean Blvd has been updated with granite countertops, flat screen TV's, new flooring and new bedding for you and your family to enjoy. With two levels of living space, families can also easily spread out and unwind with the ocean in the not so distance. Head to the main level to relax in one of four bedrooms or unwind on the adjacent deck with porch swing, or enjoy grand get togethers in the top level with living area with flat screen HDTV/DVD, dining area, kitchen, deck and ample ocean views. No matter where you turn, 23 Ocean Blvd leads the way to decadent vacation fun and relaxation, inside and out. From the crisp sea breezes to the softly colorful and inviting interior, 23 Ocean Blvd is the destination of choice for an enchanting vacation by the sea. Bring your favorite crew members, and plot your course to this Southern Shores destination where the Outer Banks lifestyle shines. Top-Level: Living area with flat screen HDTV/DVD, dining area, kitchen, deck and ocean views. Ground-Level: King master bedroom with TV and deck access, Bedroom with 2 Twins and TV, 2 Queen bedrooms and deck with porch swing. 180 feet to beach access.